The 31st Dáil meets for the first time tomorrow – so here’s our guide as to how power will move to the new coalition. THE 31ST DÁIL convenes for the first time tomorrow at noon, with the main point on the agenda being the election of a new Taoiseach and cabinet. As Fine Gael and Labour have already agreed a programme for government, it is assumed that the two parties will support a common nominee for Taoiseach. That nominee will – barring some sort of major political catastrophe in the next 21 hours – be Fine Gael’s leader Enda Kenny. That appointment won’t be the only business of the day, however – so here’s our point-by-point guide as to how things will work. Kicking off at noon, the Dáil will assemble – and proceedings will begin when the Clerk of the Dáil, Kieran Coughlan, enters and reads the proclamation issued by President Mary McAleese, dissolving the last Dáil and setting the date for the summoning of the new one. He then reads the names of the returning officers appointed to oversee the elections for the new members in each of the 43 constituencies, and then the names of the TDs that were elected – officially declaring those TDs to have been elected. As there is no Ceann Comhairle at the time, the first thing the Dáil must do is elect one. Ordinarily the government-in-waiting puts forward one nominee, and the parties set for opposition another. Given the overwhelming majority that the Fine Gael-Labour partnership enjoys in the house, however – claiming 113 of the 165 seats – Fianna Fáil may decide against putting forward a candidate, though it’s still possible that they’ll choose someone to run, safe in the knowledge they cannot win. Sinn Féin may also put forward a candidate, underlining its new prominence. If there’s more than one nominee, a ‘walk-through’ vote will be held. Voting doesn’t take place through the standard electronic means, but rather by asking TDs to walk through one of two ‘lobbies’, or corridors, to register their support or opposition to the appointment of the appropriate candidate. It’s worth noting that members don’t vote for one potential Ceann Comhairle over another (it’s not a case of A versus B) – instead they vote on whether to appoint each one (Yes versus No), one-at-a-time, with nominees being voted upon in the order in which they were proposed. If, of course, the Fine Gael-Labour nominee is unopposed, then their nominee is automatically appointed to the Ceann Comhairle’s job. The winning nominee, in either case, will take the oath of office standing at the platform beside the dais (podium) before taking the chair. Business then turns to the appointment of a new Taoiseach. As we mentioned, Enda Kenny will be the obvious nominee from the Fine Gael and Labour benches; Sinn Féin will nominate Gerry Adams, a party source told us today, and Fianna Fáil will therefore probably nominate Michéal Martin too. Either way, each party leader – as well as Brian Lenihan, who is the most senior member of the outgoing government to still be a TD – will say a few words about the various nominees, and assuming the position is contested, the same voting procedure applies for the election Taoiseach as would be used for that of Ceann Comhairle: voting is done by means of a walk through the lobbies, with candidates considered in the order they are proposed. Assuming that Kenny wins (and with such a commanding majority, it’s a certainty) there’ll be a few words of congratulations for him from the leaders of each side, and an adjournment for 90 minutes or so while Kenny travels to Áras an Úachtaráin to meet President Mary McAleese, who will present him with his seal of office. The Dáil then reassembles – with the opposition and backbenchers seated first, before the new Taoiseach ceremonially leads his new cabinet into the chamber. Thereafter, there will be a lengthy discussion – where the newly-appointed ministers generally thank their electorates, and the opposition take their opening snipes at the new cabinet – before another walk-through vote is held to ratify the appointment of the new ministers. 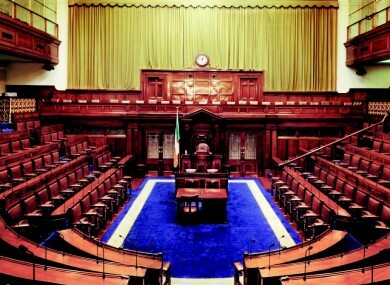 Once that’s done, the Dáil is adjourned – probably until the middle of next week – in order to allow the new ministers to get to grips with their cabinets before they get into the routine of answering questions and proposing legislation. On adjournment, the new ministers follow the Taoiseach back to the Áras, when the President gives them each a seal of office of their own. The Dáil will resume then in the middle of next week, when the Taoiseach will announce the names of the new junior ministers. Email “The change of power: how tomorrow's Dáil proceedings will work”. Feedback on “The change of power: how tomorrow's Dáil proceedings will work”.